It’s compared to the regular Prism Black finish in this render. The differences are subtle but certainly noticeable. The ceramic back has a slight metallic/brownish tint to it as mentioned in a recent report. Reports suggest that the ceramic back finish will only be available with the most expensive Galaxy S10+ model. That would be the one with 12GB of RAM and 1TB of internal storage. It’s going to cost a pretty penny for sure, over $1,700 by some estimates. Whether or not the Ceramic Black Galaxy S10+ is offered in all markets remains to be seen. Not a lot of customers would be able to justify spending that much money on a smartphone, even if it has a terabyte of internal storage. Particularly since you can still have 1TB of storage in your pocket by pairing a 512GB model with a microSD card of the same capacity. That’s how Samsung marketed the Galaxy Note 9. The ceramic material on the back would obviously provide a different feel compared to glass. The tint that we see in this render appears to extend to the frame as well. Samsung has reportedly used a special process to create this ceramic material which is more scratch and drop resistant. Samsung will confirm all of these details at its press event on February 20. 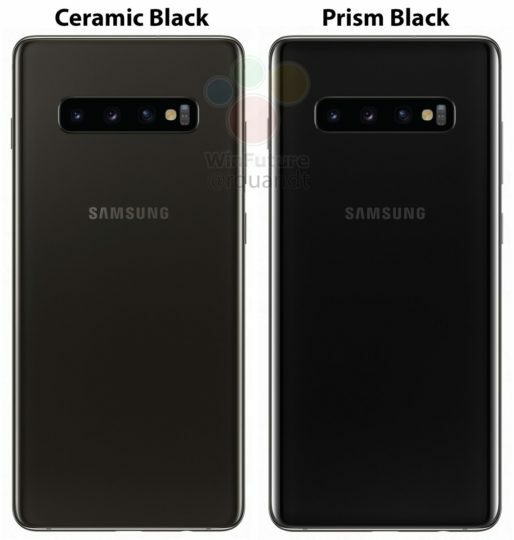 Going by what you see in this render, would you think about splurging for the Ceramic Black Galaxy S10+? Do let us know in the comments below. The 5G and folding phones are laughing at anyone thinking the ceramic phone will be the expensive one. does this have hole in front ? or any sort of cut if yes, not interested. will the ceramic be more grippy? like less slippery? I wonder when samsung will put dual tone led flash or even quad one!